SAN FRANCISCO (Feb. 8, 2018) — City Attorney Dennis Herrera announced today that he has filed a lawsuit against the State of California to invalidate aspects of a state law pushed by ride-hailing companies Uber and Lyft that exempts their drivers who live out of town from San Francisco’s business registration requirements. In passing Senate Bill 182 last year, the state legislature created a tax shelter for a favored group — Uber and Lyft drivers — and unconstitutionally usurped the power of charter cities like San Francisco to regulate their own municipal affairs, according to the lawsuit Herrera filed in San Francisco Superior Court this morning. While most Uber and Lyft drivers who drive in the City live elsewhere, the new state law prohibits San Francisco from requiring them to pay registration fees that apply to all other sole proprietors and independent contractors who do business in San Francisco, regardless of where they live. 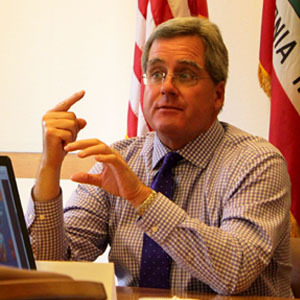 Herrera brought the lawsuit in cooperation with the San Francisco Municipal Transportation Agency and the Office of the Treasurer & Tax Collector. The California Constitution gives charter cities like San Francisco the power to regulate their own municipal affairs without interference from the state legislature. Courts have long established that, at its core, that power includes the ability to register and tax local businesses for revenue purposes. San Francisco has had local business registration and tax requirements in place for decades that businesses of all sizes, including independent contractors, must follow. Registration is required after seven days of operation in San Francisco, regardless of where the business owner lives or whether the business provides services in other jurisdictions. Business registration is the prerequisite for most City and County regulatory permits and helps protect the public interest, provide transparency and ensure businesses pay their fair share of local taxes. Uber and Lyft assert that their drivers are independent contractors to avoid paying for benefits that would be due to employees, like health care. Now they have pushed SB 182 through the legislature to exempt their drivers from laws governing independent contractors as well. SB 182 exempts many drivers that work for ride-hailing companies like Uber and Lyft, also known as transportation network companies, or TNCs, from local business requirements. Instead, these drivers would only be required to register in the city in which they live, even if the driver conducts all of their business within another city, like San Francisco, and even if the city in which they live has no registration requirements at all, as is the case in most other cities in the Bay Area. In the past several years, the number of ride-hailing company drivers has grown exponentially in San Francisco. Approximately 45,000 TNC vehicles operate on San Francisco’s streets, creating an enormous impact on local roads and infrastructure. This deluge of ride-hailing vehicles has raised roadway maintenance, enforcement and environmental costs for the City, as well as increased wasted time and fuel due to congestion. Ride-hailing companies’ vehicles account for 570,000 miles driven in San Francisco on typical weekdays, which is nearly 20 percent of the total vehicle miles travelled within the city. They are also concentrated in the densest and most congested parts of town. In the downtown and South of Market areas, they account for one out of every four cars during peak commute periods, a report by the San Francisco County Transportation Authority found. More importantly, due to the nature of the on-demand services, these drivers pose a safety concern, which City agencies must expend considerable resources to address. Uber and Lyft drivers frequently make illegal U-turns, double park, and block bicycle and transit lanes as they stop unexpectedly for customers. These drivers are also often distracted as they focus on their ride-hailing app. The San Francisco Police Department found that Uber and Lyft drivers were responsible for nearly two-thirds of the congestion-related traffic violations downtown during a three-month period in 2017. Of the 2,656 traffic violations for things like obstructing a bike lane, obstructing a traffic lane or failing to yield to a pedestrian, 1,723 went to ride-hail vehicle drivers, the SFPD determined. Collectively, ride-hailing company drivers’ actions obstruct the flow of traffic and result in unsafe streets for pedestrians, bicyclists, transit operators and other drivers. They disrupt traffic for public transit and private vehicles alike. SB 182 will particularly affect San Francisco given that only 29 percent of ride-hail drivers who registered with San Francisco actually lived in the city, according to the County Transportation Authority’s report. Another 61 percent of drivers who registered to operate in San Francisco lived in the eight other Bay Area counties, and 10 percent lived entirely outside the Bay Area. A San Francisco Chronicle analysis found that drivers came from as far as Redding and San Diego to drive in San Francisco. For San Francisco, the ability to monitor the behavior of ride-hailing companies is imperative to understanding their impact on the city. Business registrations allow the City to recoup some of the costs associated with the large number of ride-hailing company drivers. Prior to Jan. 1, 2018, around 21,000 drivers had registered with San Francisco, generating around $1.9 million in fees annually. San Francisco has over 130,000 registered businesses, and nearly every business — large or small — that operates here is required to register, including taxi drivers. It is a simple process. Registration can be done online, typically takes less than 10 minutes and costs $90 for most ride-hail company drivers. Voters set the rates. Registration provides basic information about the business to consumers. Uber’s privacy argument is also misleading. San Francisco has no requirement that drivers provide the City with a home address, for example. Drivers can list a business address, like a PO box. Herrera is asking the court to declare that the provisions of SB 182 that restrict San Francisco’s authority to require ride-hailing businesses operating here to obtain a San Francisco business registration certificate and pay associated taxes violate the California Constitution. He is also seeking an injunction preventing those provisions from being enforced against San Francisco.